Create the perfect colour and use up left-over paint with this step-by-step guide. You'll get the best results by using the same finish, and the same brand of paint. If you're going to be painting a large area, it's best to get your paint mixed professionally. Start by experimenting with small quantities of paint, bearing colour theory in mind. For example, primary colours are red, yellow and blue. Mix two of these and you'll create a secondary colour: orange, green or purple. Bear in mind that you can also mix a primary colour with a secondary shade that does contain the primary, for example lime green is yellow added to a mix of yellow and blue. To lighten the colour you come up with, add white; add black and get a darker version of your original colour. 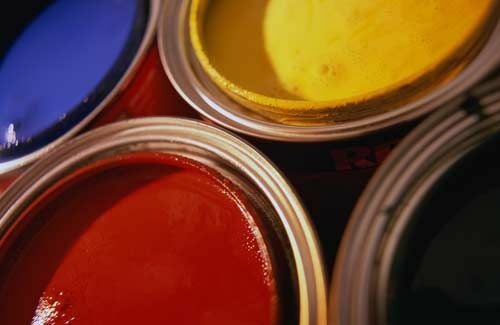 Keep track of the ratio and quantities of paint you’ve used to create your preferred shade. If you've come to a colour you're happy with, try it out on a sheet of paper or an inconspicuous area of whatever you're painting. Let it dry before making a judgement. Dry paint reflects light differently, so the colour you love in a wet mixture won't be the same when it's dry. Recreate the colour you like, this time in greater quantity, making up enough to complete the whole job. Bear in mind that it might be impossible for you to mix exactly the right shade again, so if you don't think you'll have enough paint to cover the area, play safe and get your paint mixed professionally.